We’re all aware of Christmas in July. Gastronomic feasts, great friends. Ideally recreating those nostalgic Xmas card scenes with Santa hurtling through the snow with his reindeer. Yes, the snow! Far from our real Aussie 40 degree Christmas day heat, eating prawns and drinking copious quantities of refreshments to keep us cool. Or actually lazing in the pool or by the beach. …. but Christmas in September? 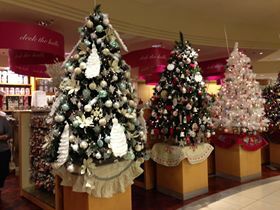 Today I saw a huge display of Christmas decorations in a David Jones store. I am sure Myer has the same. I know hot cross buns are on the shelves days after Christmas (and secretly I love that – as I LOVE hot x buns). Don’t get me wrong, I LOVE Xmas too…. but gosh, do we really need the reminder that Xmas is only, um, 1, 2, gosh 4 months away. Four months! Seriously retailers…. why do you put your shoppers through this pain? Are you insulting us? Or is it just me? ← Need some new business cards? Great seeing you yesterday. You inspired me! Thank you.